Today’s biggest structural engineering challenge is to design better structures, and a key issue is the need to take an integrated approach which balances control of costs with the requirement for handling earthquakes and other dynamic forces. Structural optimization is based on rigorous mathematical formulation and requires computation algorithms for sizing structural elements and synthesizing systems. Now that the right software and enough computing power are readily available, professionals can now develop a suite of alternative designs and a select suitable one. A thoroughly-written and practical book on structural optimization is long overdue. This solid book comprehensively presents current optimization strategies, illustrated with sufficient examples of the design of elements and systems and presenting descriptions of the process and results. Emphasis is given to dynamic loading, in particular to seismic forces. 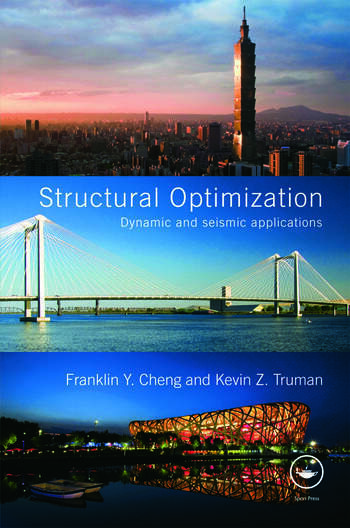 Researchers and practising engineers will find this book an excellent reference, and advanced undergraduates or graduate students can use it as a resource for structural optimization design. Franklin Y. Cheng is Curators' Professor Emeritus at the Missouri University of Science and Technology, USA. He is a Distinguished Member of the American Society of Civil Engineers, and is the author of several books including Matrix Analysis of Structural Dynamics: Applications and Earthquake Engineering. Kevin Z. Truman is Dean of the School of Computing and Engineering at the University of Missouri – Kansas City, USA.